Photograph by an unknown photographer taken in the 1870s, part of the Dunlop Smith Collection: Sir Charles Aitchison Album of Views in India and Burma. The Camperdown Pressing Company, was the agency, in Calcutta, for Cox Brothers, jute and hemp spinners and manufacturers of Dundee, who produced yarn, ropes, twine, bags, sacks, hessian and tarpaulin. The business was active as a jute-pressing concern in Cossipore from the early 1870s. This view is of the company jetty near the jute pressing works on the Hooghly river, with company lighters drawn up near the jetty and a European figure seated on the cabin roof of a bauleah drawn up at the water's edge. 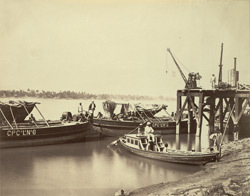 [Boliah or bauliah, from the Bengali bhulia, a type of light, narrow and swift boat with a cabin, in use on the Bengal rivers].